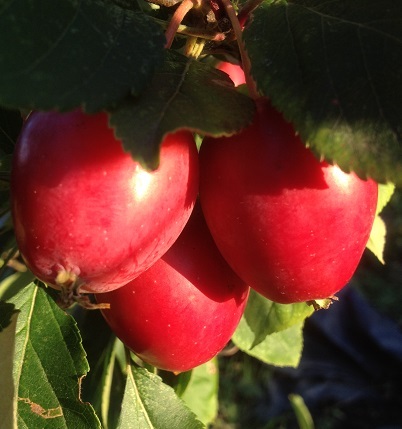 Jellying is my current obsession, inspired in part by Andy Bees saying I could help myself to his crab apples. His espaliered tree is a thing of beauty, especially in spring when all covered in floaty blossom. I’ve been throwing it envious looks all season. The apples are far larger than any of the wild ones I was going to scavenge over on Epsom Common, and are a gorgeous ruby red. I snaffled a bag of them and have been searching for interesting recipes ever since. So far I’ve made mint jelly with a mix of crab apples and Mum’s Bramleys. It’s not nearly as viciously green as the supermarket versions, but the scrapings from the jam pan tasted lovely. 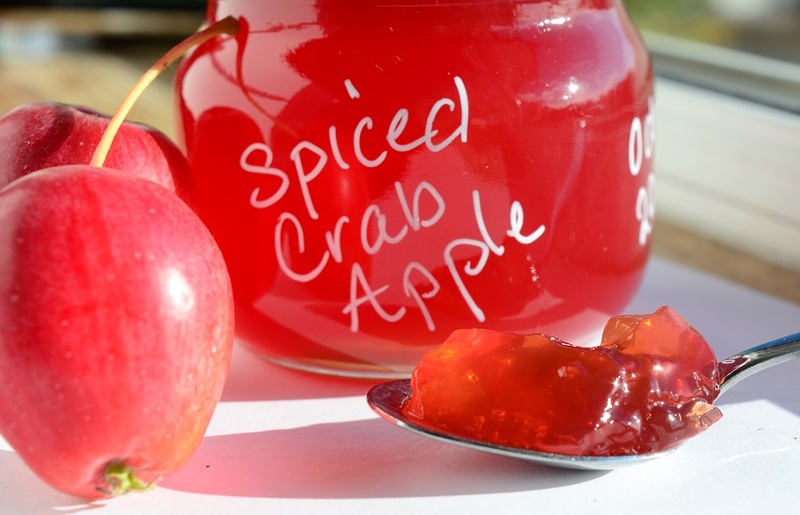 And on the weekend, inspired by Nic Wilson’s post over on Dogwooddays I made spiced crab apple jelly. The kitchen smelled like Christmas and, while the fruit leathers made with the sieved pulp weren’t world-changing, the jelly is a beautiful glossy orangey-red. I’m thinking it’ll make a perfect accompaniment to squash scones, or to smother on waffles. Because I can’t help fiddling with recipes, I used 1.5kg of washed & halved crab apples, 3 cloves, a thumb-sized lump of ginger peeled & chopped, 2 broken bits of star anise and 3 pints of water. That gave me 1.4L of juice, to which I added roughly 650g sugar. (roughly because somewhen the bag of sugar had got wet, and the contents were a bit lumpy) The result tastes wonderful, though it could possibly even take a bit more spicing. A more savoury apple and peppercorn mix would probably work well too. This year pigeons beat me to the elderberries around here and I was moping a fair amount about no new jelly. But a variable climate is a wonderful thing. A drive north to Francesca’s equates to almost a month’s delay in ripening. Harrold Country Park has a huge number of elder trees – and sloes, brambles, wild roses and alpine strawberries…one to remember for next year if I’m slow off the mark again. I don’t tend to follow the hard and fast rules for jelly setting. My elderberry jelly, simmering a kilo-ish of berries with a Bramley, takes a slightly anxious 3-4 we eks to set. 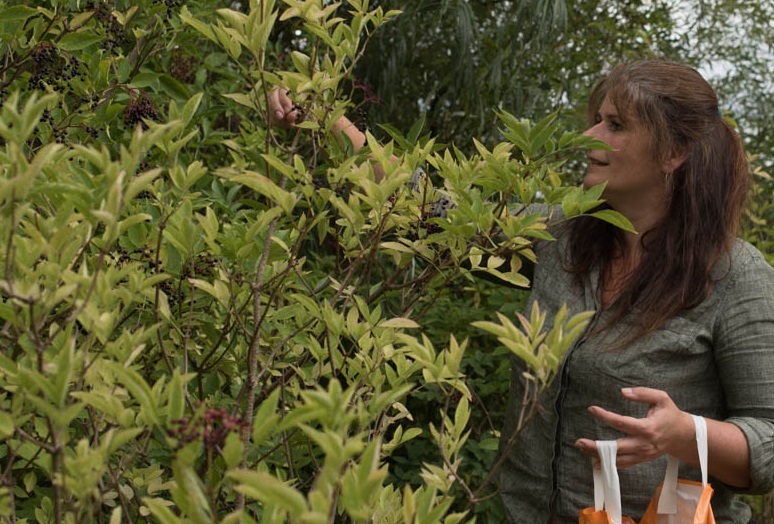 Elderberries have a really delicate flavour and cooking them too long boils the heart out of them. You can tell it’s done by tasting – the warm jelly clings to the spoon, though it won’t yet crinkle on a cold plate. (I promise clean spoons are used every time!) It is a meltingly soft jelly when it does get there. Quinces are next in line, and perhaps a trial run at doing something syrupy with rosehips. 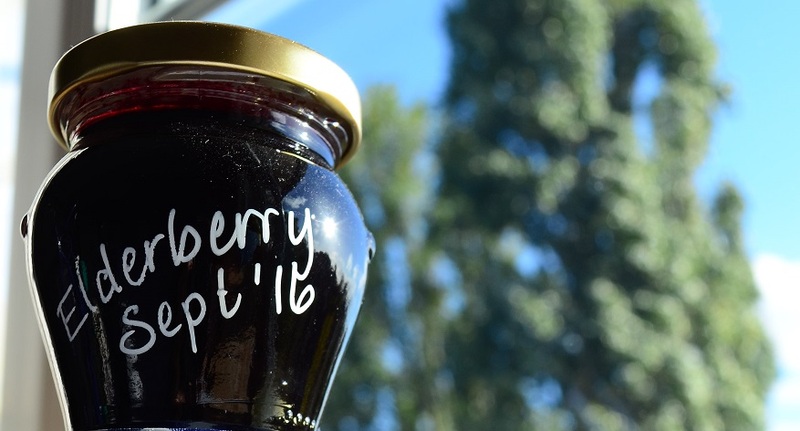 Thank you – am slightly regretting 6 jars of mint jelly…2 would have been fine! Want some? Me too – I’m starting to get windfalls so they’ll be ripe for picking soon. In the meantime I’m going to have spiced candy roaster scones with apple jelly, clotted cream and a pot of coffee.